Following on from the period Caledonian 707 model last month here is one of those newly released retro models. 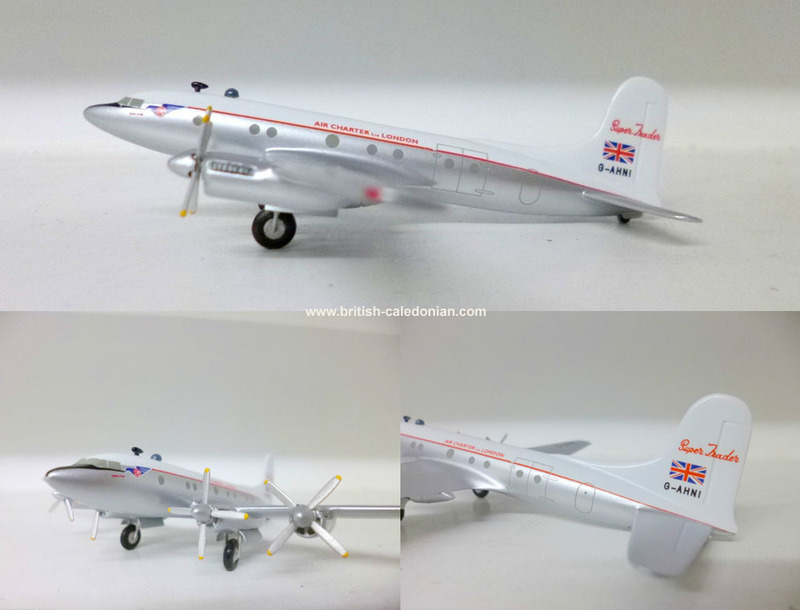 This one is a 1/200th scale model of G-AHNI, an Air Charter Avro Tudor 4B (Super Trader variant) and is produced by Sky Classics. In September 1953, Aviation Traders bought a number of redundant Avro Tudors from BOAC. The Tudor was Britain’s first pressurised airliner and had a number of problems from the start. They had lost their Certificate of Air Worthiness for passenger service in 1951. (1) All light-alloy piping on the hydraulic system removed and replaced by steel pipes, re-positioned where necessary to avoid electric cables. (2) Removal of combustion heater and associated equipment. (3) Removal of ventilation air fan and associated equipment. (4) Removal of pressure refuelling system. (5) Removal of all pressurization equipment. (6) Introduction of new ventilation system utilizing external air scoop. (7) Introduction of cabin heater system employing tubular heating elements (as used on Tudor 2 G-AGRY). (8) Modification of all engines to the Merlin 623 standard, giving an increased take-off power. (9) All electric cabling rerouted clear of the floor of the aircraft. (10) All electrical and radio components removed from under the floor and re-positioned to reduce fire risk. (11) Addition of emergency escape exit on starboard side of fuselage. (12) Manufacture of lighter escape hatches in centre-section of passenger compartment. (13) Incorporation of reclinable Paymaster seats approved for up to 9G loading. (14) Incorporation of single-piece longitudinal seat rails approved for up to 9G loading. (15) Introduction of fixed oxygen system for the crew. (16) All main landing wheels changed and replaced by latest-type Shackleton wheels. (17) All single piece airscrews replaced with those of split-barrel type. (18) Introduction of passenger amenities such as toilets, galley, baggage compartments and extra windows in the fuselage. The Super Trader received a full Certificate of Airworthiness on 2nd February 1954, following type testing by the Air Registration Board on G-AGRI. They commented that this aircraft was better in 1954 than it was when it was originally flown in 1946. 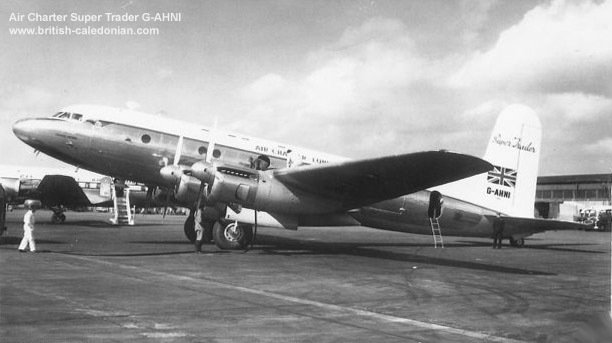 G-AHNI served in the Air Charter fleet from 1954. She was recorded as permanently withdrawn from use in 1963 but I believe she had been storage and slowly parted out at Stansted from around 1958 before eventually being broken up in 1963.